So last week we didn't have the surprise of an Olympian joining us, but the Core Team did know we were in with a chance of a bigger surprise of the BBC joining us this week. It's been 10 days of lots of phone calls to me and Simon (plus us comparing notes inbetween) and planning but I hope the end result was our runners enjoyed the experience and are proud of what it means to parkrun and Southport parkrun. Even though I noticed a Friday morning tweet off Sefton council, we had been told to keep it to a need to know basis so only those on the Core Team or involved with interviews knew what was happening. I suspect arriving at the park to the "BBC Filming" signs might have been the first warning many of you had. Because of the filming Tom Williams (Chief Operational Officer parkrun Global) and Chris Jones (Head of Finance & Fundraising parkrun UK) brought various family members along to run with us. Full marks here to Chris and his wife who camped up at Carr Cross and then used public transport to get to the event. Last time Chris and wife Liz ran with us they camped at Woodvale, got the bus to Hesketh Park and then walked back. 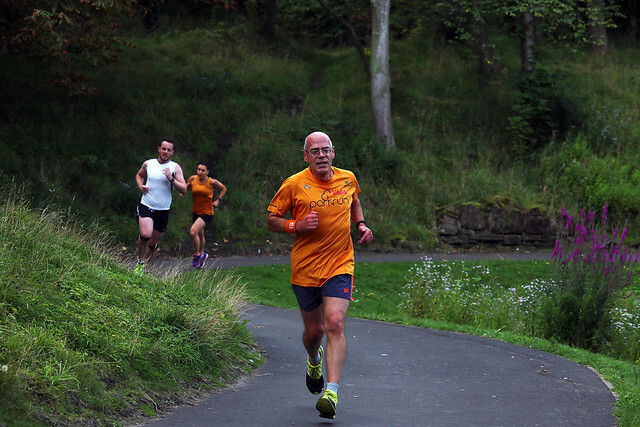 If you can find a better example of parkrun's push for people to not drive to events then do please tell me! I'd also mentioned the filming to Paolo Dale (our parkrun ambassador) so he joined us and by pure coincidence Adam Pickup (Event Director Worsley Woods) made a visit. Head Office and in particular James Kemp (Global Operations Manager) have been great in the build up. I was aware that delivery of new branded equipment should start just before the filming and continue to mid September so suggested to Chris it would be great if we could get ours in time. It should have been something out of Head Office's hands as most of the equipment had gone to the delivery company, but James pulled strings and we received ours in the first batch to be sent out. Even the tape, which only started to be sent on Friday, landed with me 09:30 followed by a spare plain one 'just in case'. So, what was it all about? You might remember that a couple of months back we were asking you to vote for the parkrun VI Scheme in the National Lottery Awards. 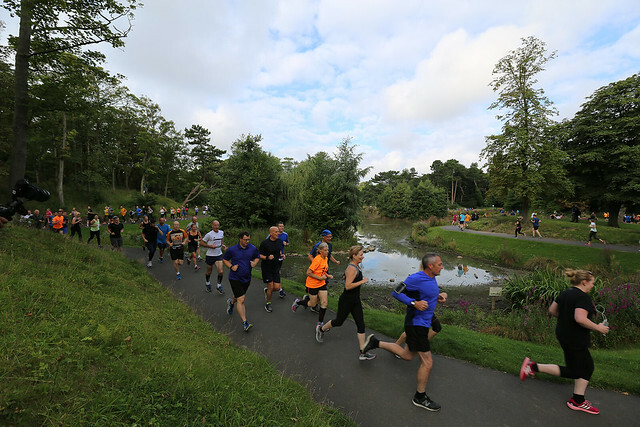 The parkrun VI scheme was revealed to be a finalist and the BBC needed a location to film the finalist's video for broadcast in the program on 27th September. Obviously, a London event would have been more simple for them, but Head Office were desperate to get them to film in Southport and at the beginning of the week the BBC confirmed they agreed. The stats from Chris Jones explain why they were so keen. Up to the 19th August we've had 9 VI participants (during this week's run we were introduced to another VI runner who we didn't know about at Southport, so that's now 10 including 7 that have Southport as their home parkrun) completing over 120 runs and 12 volunteer roles, guided by 38 different people. 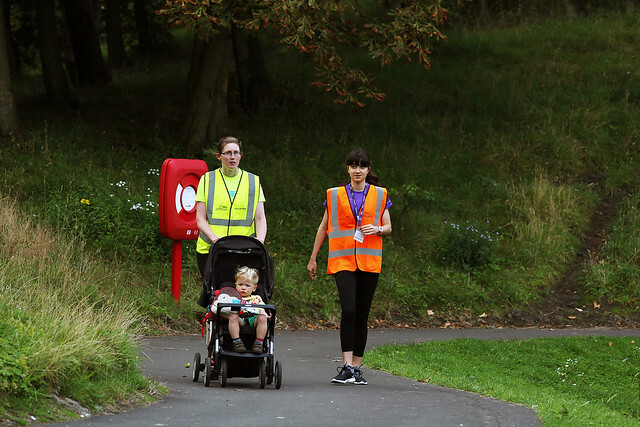 No other UK parkrun has broken 100 guided runs and only Gladstone (37) and Ecos (21) have also had more than 20 guides. Considering we're only 65 events old this is some achievement, especially as the guiding only really took off here just before Christmas. And that's all down to Mike Leatherbarrow and Simon Tobin, who had a chat about an idea of extending Mike's guiding and bringing it to our parkrun. Because so many people have got involved with guiding here and because the regular runners (and walkers) are so accommodating it has become a huge success. Our course is far from ideal for guiding and I could find plenty in the area that would be easier, but it's things like runners when a guide shouts a short warning not taking offence but happily moving over and cheering us past that makes it work. This has been a team effort at Southport so I really do hope everyone involved in the event is proud to be involved and takes the BBC visit as an honour. The BBC had asked if we could delay the start until 09:30, but I'd said not possible especially as the forecast was heavy rain. There was the surprise of being handed a megaphone for the Pre Run Briefing ("it's more effective for the sound recording" - so they were filming the PRB!!!) and after the PRB I wasn't expecting Michelle Ackerley to appear and tell us parkrun had won to be followed by a stunned silence. They did have to abandon the interview after a few minutes when they realised almost everyone had walked off to the start (I warned them you would if we delayed more than 5 minutes!). Huge thanks then to those that hung around at the end to cheer on finishers for the TV to film and then re-filmed (twice) the announcement again. I think the cheers that time really went down well. After a few interviews, Simon, Mike, Catherine, James, Ed and myself sat outside of the cafe and talked to Michelle, mostly on camera, whilst Katie, Helen and a few others were abandoned to sort the results inside the cafe. Katie did a sterling job (as do all of the Core Team, every week) of managing the run whilst most of us deserted her for the cameras. I had to get away from the park after my interview at 12:30, but the filming continued until 18:00. That's a lot of footage for a 2 - 3 minute film! Carl Pedder also had a Go Pro on behalf of the BBC and they were flying a drone too (drones are not normally allowed at parkruns, but the BBC have correct licenses). Feedback from our visitors since then has been great. Obviously all enjoyed it and we did parkrun proud. We even managed to find someone walking 3 ferrets through the park for a bit of "real Northern filming" much to the crew's delight. I think that was the only time the crew had to run! For anyone wondering why Michelle Ackerley does not appear on our results (she did complete the course) it just shows that "No barcode, no result, no exception" really does apply to everyone. Thanks to Catherine Fearnley who assisted in the PRB with the important H&S announcements of the under 11s rule and short leads for dogs and be considerate to other park users. The only other announcement this week was a happy birthday to Matthew Tobin. I should also have mentioned that this week saw the 3,000 unique registered runner crossing our finish line. 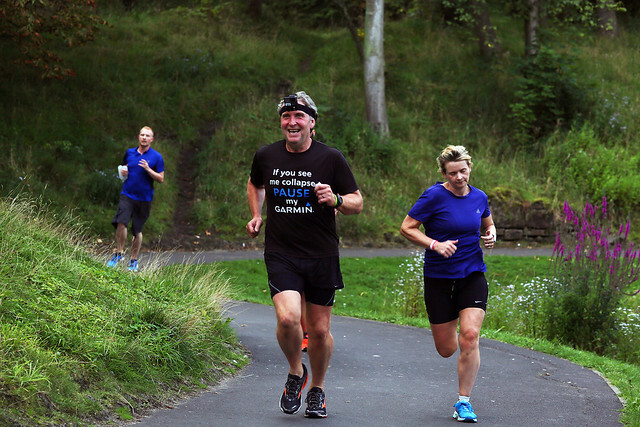 A huge welcome to the 23 people who ran parkrun for the first time with us this week. It's not normally that mad! Also welcome to the 18 people who came touristing from other parkruns for the first time. This week 310 people ran, jogged and walked the course, of whom 41 were first timers and 65 recorded new Personal Bests. Representatives of 17 different clubs took part. Today's full results and a complete event history can be found on the Southport parkrun Results Page. Southport parkrun started on 11th June 2016. Since then 3,019 participants have completed 16,050 parkruns covering a total distance of 80,250 km, including 3,915 new Personal Bests. This entry was posted in Run Reports by southportoffice. Bookmark the permalink.